Alwar Fort is a large fort and also known as Bala Quila which means 'Young Fort'. Located at the top of 300 mar steep cliffs, Alwar fort is facing the Alwar city. This fort is built by Hasan Khan Mewati in 1550 A.D.Alwar fort is 5 km long and 1.5 km wide and has six historical entrances - Chand Pol, Suraj Pal (named after Raja Suraj Mal of Bharatpur), Jai Pol, Kishan Pol, Andheri Gae and Laxman Pol. Legends says that Pratap Singh, founder of Alwar state entered in the fort through Laxman Pol. Laxman Pol is the only mattled road which connects city and fort. Hasan Khan Mewati built the Bala Quila in 1551 AD. After that, Alwar fort was ruled by Mughals, Marathas, and Jats. Lastly in 1775 A.D Kachhwaha Rajput Pratap Singh captured it and laid the foundation of Alwar city near it. Babur, the Mughal emperor had spent a night in the fort whereas Jahangir stayed for three years during exile period and at that time he named it as Salim Mahal. Alwar Fort is counted among the largest forts in Rajasthan which extends in the range of 5 kms. The fort has 6 entrance gates and is known by the name of Pol. The 6 gates of the fort are Chand Pol, Suraj Pol, Krishna Pol, Laxman Pol, Andheri Gate, and Jai Pol. Each of these gates is named after some rulers and narrates their chivalry. The fort is built in a number Style and the walls of the fort have beautiful scriptures and sculptures carved in them. Besides these beautiful carvings the fort also have number of other notable buildings like Suraj Kud, Salim Nagar Pond, Jal Mahal, and Nikumbha Mahal Palace. The fort also has numerous temples inside its campus. By Road: Alwar Fort is located on Bala Quila Rd, west of Alwar city at a distance of 7 km. One can easily reach here by taking rickshaws or simply by walk (Take permission before). Follow Vinay Marg and Alwar-Jaipur Rd to Housing Board, Rundh Bhakhera. At the roundabout, continue straight and At Killa Circle Auto Stand, continue onto Bala Quila Rd. You will pass by a Shiva temple on the left .Turn right to stay on Bala Quila Rd from here it is about 5 km. By Rail: Alwar Fort is well connected through nearest Alwar Railway station to major cities railway stations like Delhi, Agra, Mumbai, Chennai, Bikaner, Pali, Jaipur, Ahmedabad. 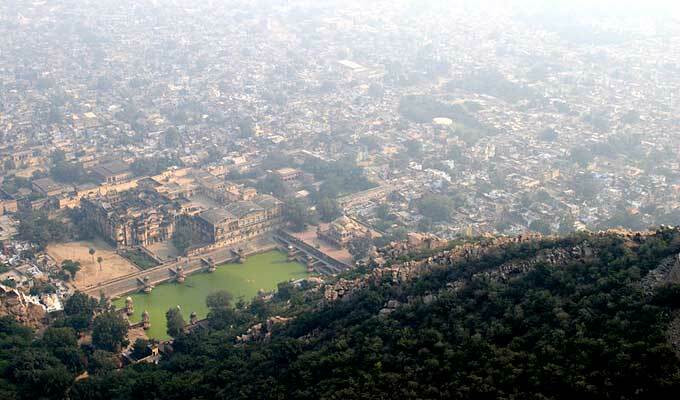 By Air: Alwar Fort can be reach through nearest Jaipur Airport (157 km) and IGI Delhi Airport (147 km) which is well connected with regular domestic flights to Delhi, Mumbai. Alwar Fort can be visited with permission from the superintendent of police who sits at his office in the City Palace complex.